It's a great time to be a green tea fan in North America. 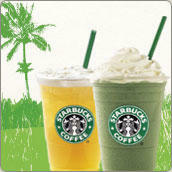 After years of serving them up in Asia, Starbucks has brought their fancy green tea drinks across the Pacific. Exciting! I'm not a Starbucks regular, except for the odd winter warm-up hot choc. In the summer, I'm a big Second Cup patron - their Frrrozen Hot Chocolate and blackberry Italian sodas are hard to best. But since last Wednesday's launch, I've tried two of the Starbucks Green Tea Frappuccinos. Verdict? I think, I think, I like them. They taste was pretty much like a milkshake made from green tea ice cream. The drink was a little sweeter that I had expected, and I thought there was just a suggestion of mint in there, too (have since read this article which confirms my suspicions). I probably would prefer the pre-market research extreme green tea flavour, to be honest. Perhaps it's silly, but my very favourite thing about the drink is its vibrant, fresh green colour. Let me know your opinion if you give one of these drinks a try! i'm having a tall glass of tazo green tea at the moment for bfast. i've never liked it, to be honest. it just happens to be free from work. (the tazo black "awake" tea is far better, but still bad for black teas). can you be a tea snob if you knowingly drink bad tea? :? I tried both. I like the iced tea but thought the frappuccino tasted very strange. I think it might have something to do with the milk/cream. I don't normally add anything to my green tea except honey or maybe some ginger. Oh, maybe it's because of the milk that it was too sweet... I'll give the iced tea a try! Hikaru, are you saying Tazo is bad? I like the peppermint green, 'refresh', is it? But I'm no tea snob: I like pretty much all tea, cheap and posh alike. honestly, this is my favorite frap drink at bucks. the only thing is that i feel guilty drinking it because it is such a heavy drink... no lite version yet (but that would ruin it!). the drink is kind of like green tea candy with a lot of fat. that is the best way i can describe it.